Well, for one, it’s the only installment of the classic series–aside from the original Gojira–which treats its monsters as metaphors. In addition, it’s just one damned freaky piece of celluloid. There are split screens, animated sequences and psychedelic montages. Fish-headed hippies dance to a rock beat. The twangy music score is…quirky. A lot of folks dismiss it for exactly these reasons, but coming as it did during the waning days of the Godzilla franchise, it’s at least trying. Hedorah may have come from the stars, but he’s really a monster of our making. His initial, tadpole-like form rapidly grows and mutates in Earth’s polluted environs. He metamorphs into a massive, slithering ooze; a smog-propelled flying saucer; and, finally, a walking nightmare towering over Godzilla himself. 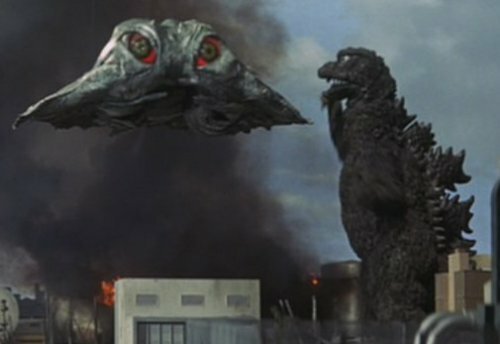 While most of his Toho brethren avoid killing people on-screen, Hedorah mows down civilians by the dozens with his toxic emissions. However–and I swear that I am not making this up–he does not eat kittens. Another reason to love Hedorah. Once again, I have to give props to the producers of CBS’ The Big Bang Theory. Not only did Monday’s episode feature Sheldon sporting a nifty t-shirt festooned with silhouettes of Godzilla, Rodan, Mothra and King Ghidorah, but a later scene had the whole gang sitting down over a game of Talisman. I don’t think that they ever mentioned it by name, but the board was recognizable and the dialogue even made reference to specific elements of the game. It would’ve been easy to have them playing D&D (or a generic D&D knock-off), but it’s clear that someone there really knows their geeks. I’m totally loving the version of Aquaman that appears on The Brave and the Bold. In recent years, Aquaman’s often been portrayed as a pissed-off, surface-dweller-hating Sub-Mariner clone, but the new cartoon series casts him as a hilarious braggart who loves to give exciting names to his many daring adventures. Last Friday’s episode involved him and the Atom shrinking down to enter Batman’s bloodstream and combat a virus. Never mind that they simply swam around without so much as a rebreather. (As my friend Dave Lartigue points out, blood cells carry OXYGEN, duh.) At one point, Aquaman decided to use his telepathic fish-summoning power, and sure enough, a cell answered the call. It was vaguely horse-shaped. It even whinnied. And Aquaman promptly dubbed his new steed “Platelet,” much to the Atom’s chagrin, as it was clearly a lymphocyte. It’s funny stuff, and it’s still online. Another news item: this morning a guy in Colorado Spring held up two convenience stores. With a Klingon bat’leth. Hello. 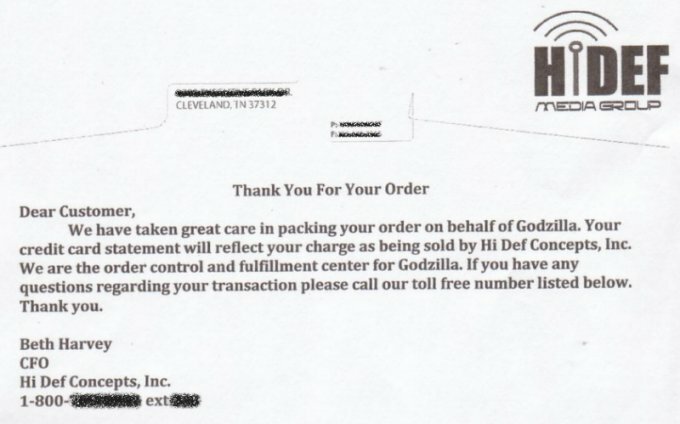 You have reached the Godzilla fulfillment center. If you have scheduled a rampage, press 1 now. For Smog Monster removal services, press 2 now. For all other calls, stay on the line for the next available agent. A tiny princess will be with you shortly. As you might expect, I didn’t waste much time before going to see Cloverfield. A major American studio releases a giant monster movie? Damn skippy I’m there. In brief, I enjoyed it a lot. It offered no more than the contents listed on the label, but it accomplished what it set out to do. It took the traditional monster rampage down to street level and made it an intense viewing experience. While it’s accurate to describe Cloverfield in terms of the original Godzilla and The Blair Witch Project, I think that you can throw a few more influences into the mix. As in Spielberg’s War of the Worlds remake, it never strayed from the protagonists’ view of events; we knew only what they learned from direct observation and second-hand chatter. It also reminded me of the cult classic Miracle Mile, which took place over a single night as the main character delayed his escape to safety (in that case, from a purported nuclear holocaust) to go back for his girlfriend. Most obviously, it was reminiscent of the American Godzilla remake, hence the title of this post. In addition to the New York setting, here too was a giant monster which spawned a horde of ground-level critters to offer a more direct threat to the humans. I don’t know that anyone set out to throw it in the face of Dean Devlin and Roland Emmerich and show them how to make an effective monster movie, but there it was. Japanese monster flicks rarely concern themselves with the humans inevitably seen fleeing underfoot. They tend to be about the spectacle of mass destruction and the response of scientists and armies. Giant Japanese monsters (colloquially known as “kaiju”) almost never target their rage on individual people. It’s that aspect of Cloverfield, rather than the “Blair Witch”-cam, that made it unique. Another welcome aspect of Cloverfield was that it got back to the old idea of the kaiju as metaphor. The first Godzilla was, of course, directly inspired not just by the destruction of Hiroshima and Nagasaki, but also by American testing of atomic weapons in the Pacific. The American Godzilla, however, had none of that, and in fact went as far as to blame the big lizard on the French. With Cloverfield, the monster was very much a stand-in for the terror of 9/11, something a great deal closer to our anxieties than French nukes. It ain’t subtle, but neither was Godzilla. While both films pretended to be “found footage” from a discarded camcorder, one advantage that Cloverfield had over The Blair Witch Project was that there’s deliberate planning behind-the-scenes. The camera might’ve been whipping around, but it wasn’t just capturing random, improvised footage. You saw what you needed to follow the plot. The monsters were effective, and for the most part the filmmakers wisely adopted a less-is-more take: there were only a handful of shots in which we got a good look at them. The main creature was some sort of anorexic, bipedal lizard (hmmm, like the American Godzilla? ), and its parasites were nasty, screechy bugs. Assuming that Cloverfield does as well as its opening night box office take suggests, I think it would be fun to see a “sequel” in which we get a more traditional take on the same events. While that might sound like just another kaiju flick, I think it would have the advantage that we, the audience, would know that even while we’re watching the destruction on the macro level, down on the micro level there are individual people we’ve already met fighting to survive. Yesterday I received a box full of giant monster goodness courtesy of my favorite Godzilla retailer (yes, there are more than one) Chibi Goji Toys, and while trying to figure out how to work a half dozen more vinyl figures onto my existing display shelf, I was inspired to photograph the assembled horde. 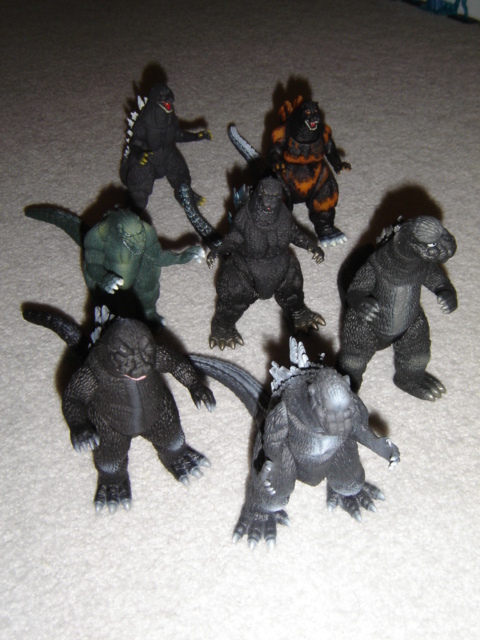 Pardon the size of the photos, dial-up users, but Godzilla and his friends beg to be large. 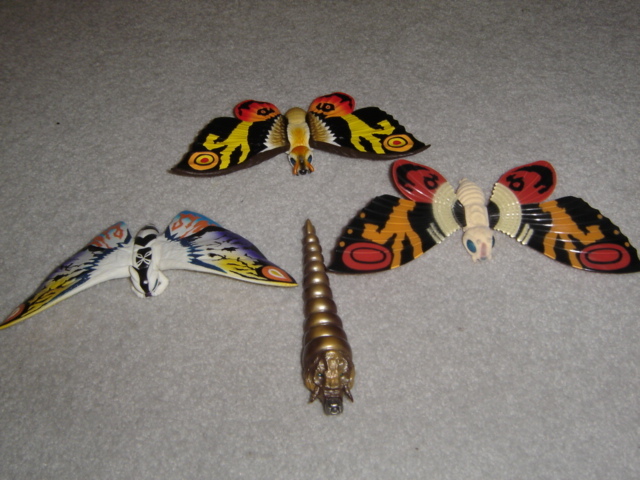 Mothra Squadron ready for takeoff! 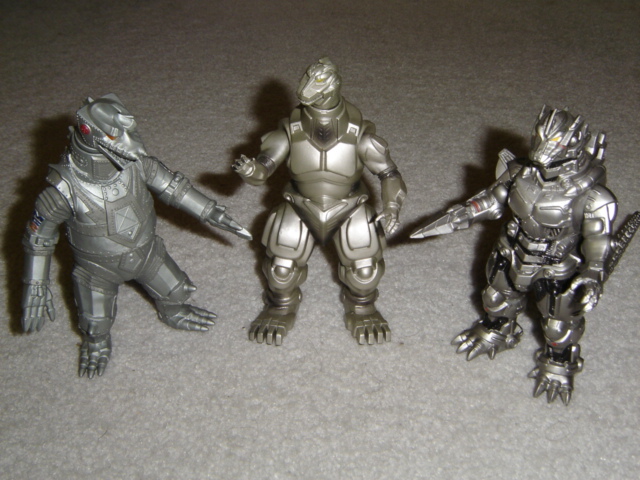 Three generations of robot Godzillas. Evil is on the march! Earth’s monsters stand ready to defend the planet! 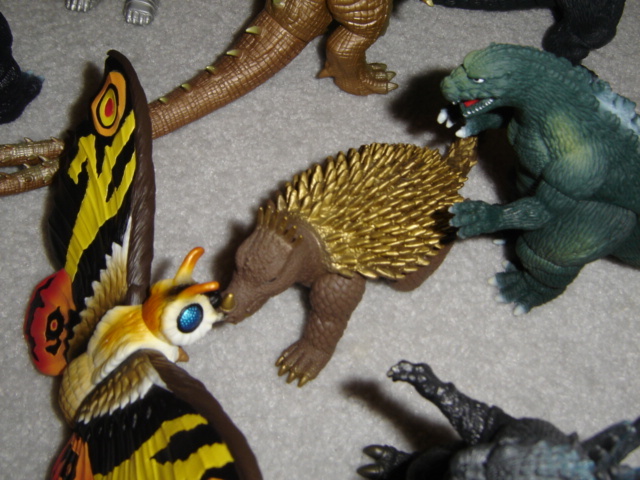 Angilas finds himself outmatched by Mothra and Godzilla Jr. Meanwhile, a variety of mutants, both human and monster, have cropped up. The human mutations have banded into a fighting force against the giant horrors that continue to threaten mankind. This allows for a lot of X-Men meets The Matrix martial arts action that’s strange to find in a Godzila film, but leads to a fun sequence in which humans battle hand-to-claw with the oversized lobster Ebirah. This film is a loopy love letter to the ’60s/’70s Toho monster fests, and much of the action recalls the rubber-suit wrestling matches common to them. One of the highlights is a four-way scrap in which Godzilla, Rodan and King Seesar use the armadillo-like Anguirus as a makeshift soccer ball. In other respects, Final Wars is something entirely new to the series, with its rock-music soundtrack, fast-paced editing and Adam Ant alien leader (Kazuki Kitamura in one of the great scenery-chewing performances). And for the first time, Toho ventures outside Japan with brief location sequences in Sydney and New York. 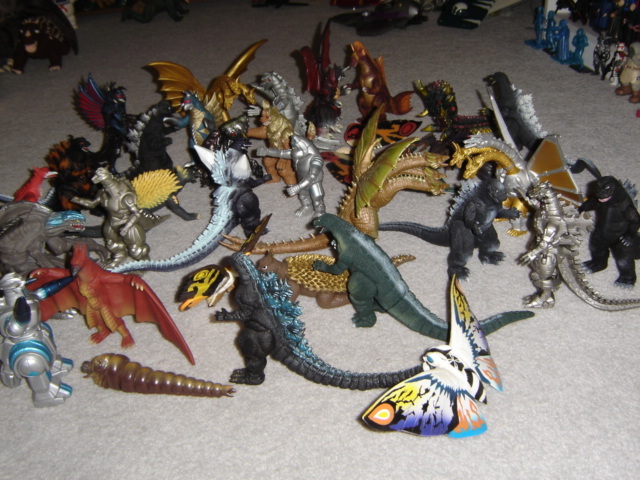 The monster roll call is a treat for old-school kaiju fans, with nearly the entire roster of classic Godzilla friends and foes: Minya, Godzilla’s offspring; Rodan the supersonic pterodactyl; Mothra the (what else?) 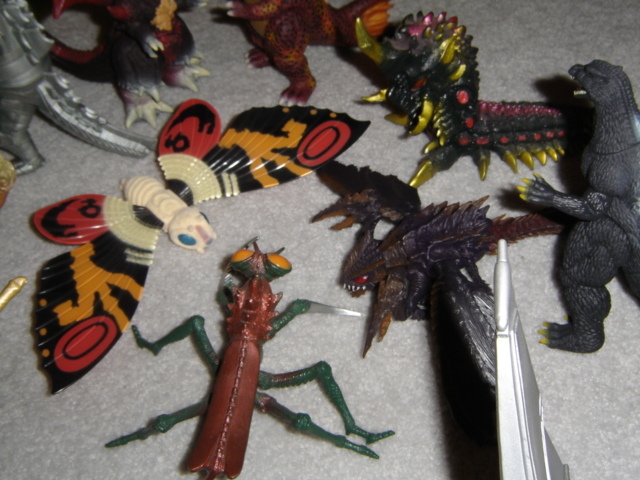 giant moth; the aforementioned Anguirus and King Seesar (the latter a humanoid foo-dog last seen in ’74’s Godzilla vs. Mechagodzilla); Manda the sea serpent (from Atragon); the crustacean Ebirah (Godzilla vs. the Sea Monster); cyborg whatzit Gigan (who once teamed with the cockroach-like Megalon); Hedorah, the walking pile of sludge (Godzilla vs. the Smog Monster); Kumonga the spider and Kamacuras the mantis (both from Son of Godzilla). The most amusing inclusion is that of the American Godzilla, now downgraded to another Xilien pawn and renamed “Zilla.” The fight between Godzilla and the pretender to his throne is kept deliberately short. One of the most common complaints is that the majority of Godzilla’s opponents are dispatched too quickly, but given that there are seven distinct battles, not to mention numerous other scenes of mayhem, it’s probably for the best that they weren’t dragged out. 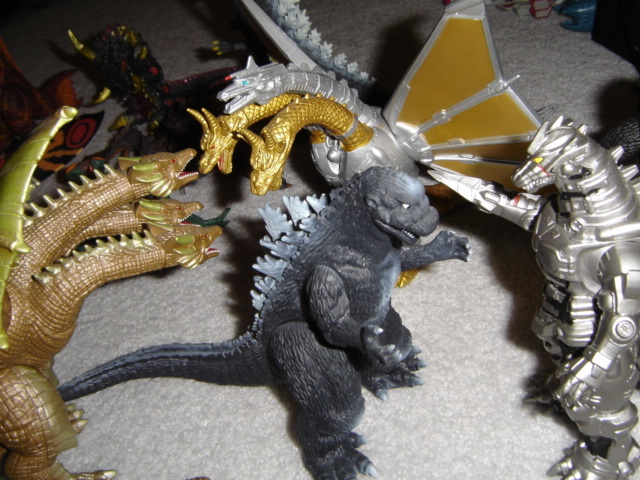 After all, the real showdown is the final four-way tag team match with Godzilla and Mothra against Gigan and the mysterious Monster X.
It’s all giddy, nonsensical fun, not to be taken seriously for even a moment. This year marks the 50th anniversary of Godzilla, king of the movie monsters. Through 27 feature films–with the 28th, Godzilla Final Wars due later this year–the reptilian titan stomped his way across Japan and straight into my heart. 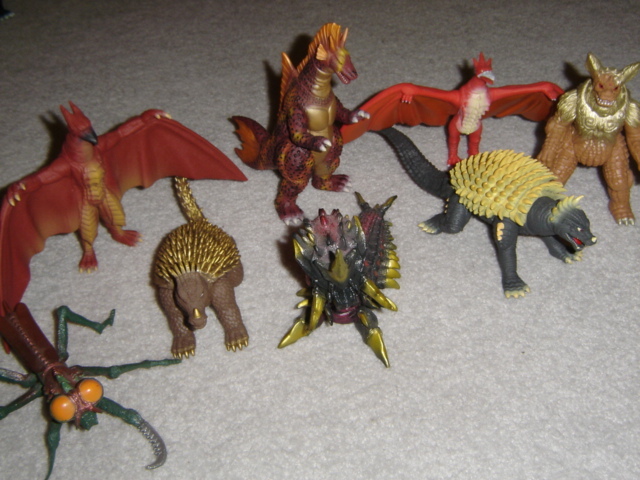 My love affair with Godzilla began as an outgrowth of my early interest in prehistoric animals. By the time I’d reached kindergarten, I’d memorized many dinosaur names and already had plans of becoming a paleontologist. So, what could be better to a young fan than the biggest dinosaur of them all? In addition, there was certainly an appeal to the notion of putting on a rubber reptile suit and stamping through a model of Tokyo. Even back then, I was aware that there was a sweaty Japanese man inside Godzilla, but that didn’t diminish my infatuation. Furthermore, information about Godzilla wasn’t readily available. Sci-fi film books tended to be dismissive of the Japanese efforts, and even the groundbreaking fan magazine Famous Monsters of Filmland offered maddeningly incomplete or inaccurate articles. Things have largely improved as I’ve grown up. Numerous books, magazines and websites have fully detailed the history of Godzilla’s friends and foes. 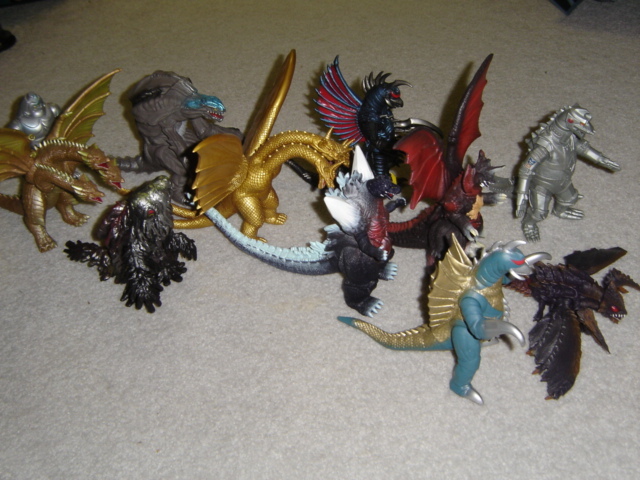 Vinyl toys of virtually the entire Toho Studios bestiary have been imported to U.S. specialty stores, finally satisfying the frustrated eight-year-old within me. On the other hand, the movies themselves rarely show up on TV anymore, and usually only on obscure cable channels I don’t receive. DVD releases have been spotty; many Japanese monster films are still MIA and others have been produced as low-quality discs. Thankfully, there’s been some improvement on that latter front. Sony recently released three of the ’70s Godzilla flicks on DVD, and more are coming soon. Watching Godzilla vs. Hedorah (aka Godzilla vs. the Smog Monster) again last month took me back 30 years. As an adult Godzilla fan, I’ve tended to look down on the period in which the Big G–who began as a clear metaphor for the destructive power of the atom bomb–served as a kid-friendly defender of humanity. However, I have to admit that there’s something very compelling about this kinder, gentler monster who rises from the ocean depths to combat the menace of pollution. Last week brought the release of Godzilla: Save the Earth for the Playstation 2, allowing me at last to stage my own fantasy match-ups between (for example) Megalon and Megaguirus, Jet Jaguar and MechaGodzilla 3.